Ever since the general polls in AP were held, YSRCP and TDP's presidents have been exhibiting contrasting behaviours. While CBN is indirectly admitting his defeat expressing his frustration, Ys Jagan Mohan Reddy's gestures and his happiness in face appeared that YSRCP would be getting the victory with a thumping majority. 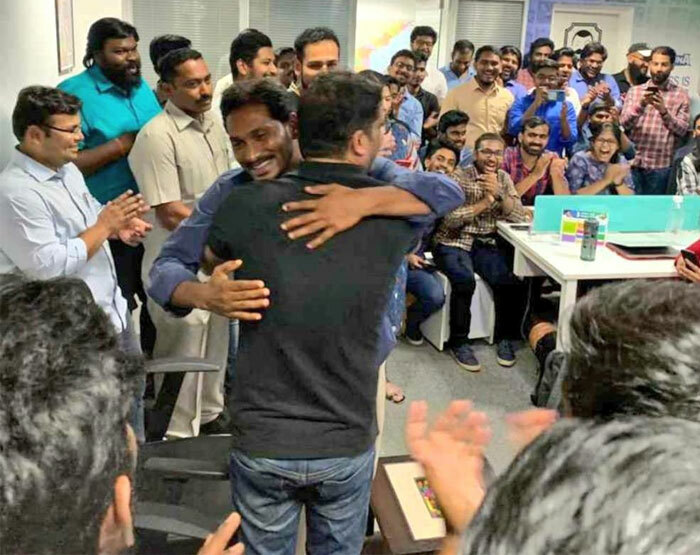 The other day, Ys Jagan met his party's strategist Prashanth Kishore and other close aides. They chanted the words 'CM..CM..' etc. Having watched the video on net it was felt that all is well set for Ys Jagan to become the CM and that's why he was showing extreme happiness in his face. However, internal sources made it clear that it was the fake happiness being shown by Ys Jagan. "Right from the beginning itself, Prashanth Kishore kept on advising Jagan to exhibit tremendous confidence of victory in his gestures in spite of a strong opponent Janasena party and ruling TDP in the race. Like 'Ramudu Manchi Baludu', Ys Jagan obeyed the words of Prashanth Kishore and started showing confidence of victory in his facial expressions. But then, Ys Jagan is immensely worrying about his victory in the poll battle," say the sources. "YSRCP clearly knows abnormal majority wouldn't be possible in triangular fight. Hiding this fact, the party's head appears to have been acting," opines an observer.